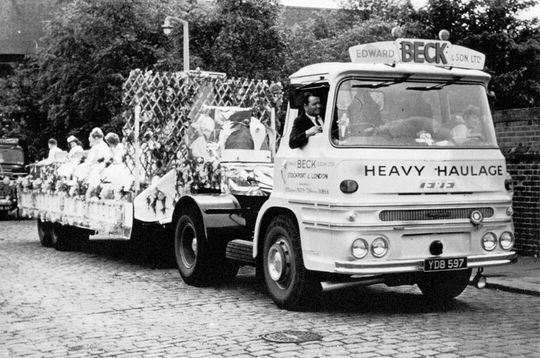 Throughout the 1950's and 1960's Edward Beck & Son Ltd were regular participants in the Stockport Carnival supplying floats for the local charity event. Not only was it for a worthwhile cause but it was also an opportunity to publicise the company and also display the latest additions to their fleet. These were the days when local haulage companies would be more than happy to supply a vehicle for local carnivals and events, unlike the big multinational owned companies of today, whose hands are tied due to over the top health and safety laws. 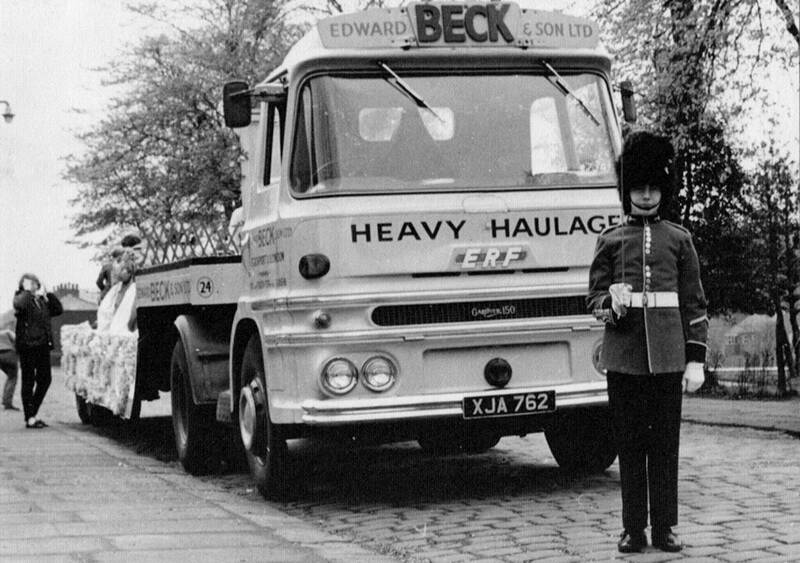 In 1964 ERF 64GX heavy duty 4x2 tractor unit Reg No YDB 597 was called upon to transport the Rose Queen of St Elisabeth's Church Reddish. 1965 and Boalloy Cabbed ERF 4X2 tractor unit Reg No XJA 762, powered by a Gardner 150 engine, was the chosen that year to haul the float carrying the rose queen of St Elisabeth's Church Reddish, which went on to win 1st prize in the carnival. 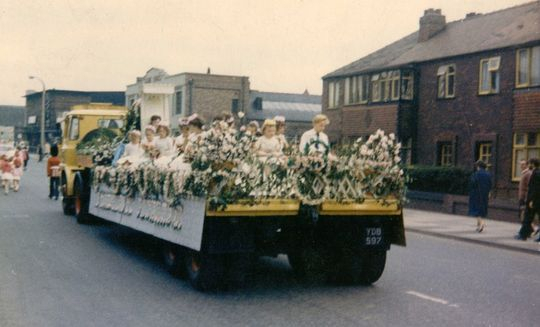 A colour shot of the float carrying the 1965 Rose Queen of St Elisabeth's Church Reddish as it heads down Gorton Road Reddish. The houses on the right are still there today but everything else in the picture has changed, including the demolition of the old Essoldo cinema in the distance. 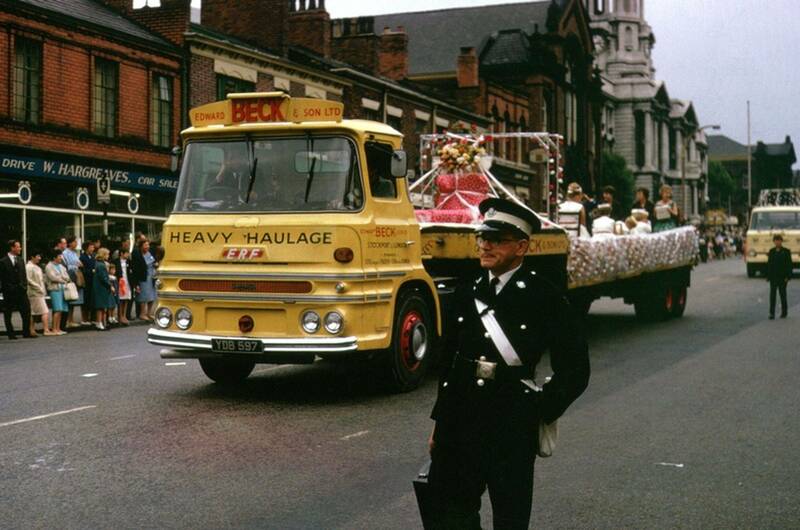 Thames Trader 4x2 tractor unit Reg No CJA 848C makes its way past the town hall on Wellington Road South in 1967 with the local Rose Queen on board during the annual Stockport Carnival. 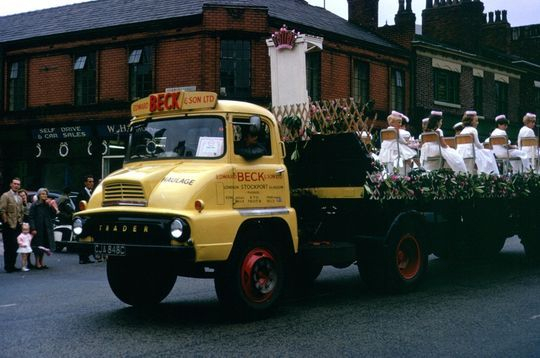 Another shot of Thames Trader 4x2 tractor unit Reg No CJA 848C as it makes its way down Wellington Road South in 1967 with the local Rose Queen on board during the annual Stockport Carnival. 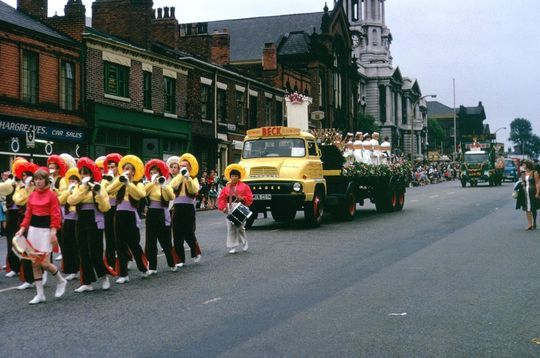 A close up shot of Thames Trader 4x2 tractor unit Reg No CJA 848C as it makes its way down Wellington Road South at the junction with Horbury Street in Stockport during the annual Stockport Carnival in 1967. Thames Trader 4x2 tractor unit Reg No CJA 848C makes its way down Wellington Road South towards the town centre during the annual Stockport Carnival in 1967. Boalloy Cabbed ERF 64GX heavy duty 4x2 tractor unit Reg No YDB 596 makes its way past the Town Hall on Wellington Road South in Stockport transporting the St Pauls Rose Queen during the annual Stockport Carnival in 1967. Another shot of Boalloy Cabbed ERF 64GX heavy duty 4x2 tractor unit Reg No YDB 596 as it makes its way towards the town centre during the annual Stockport Carnival in 1967 with the St Pauls Rose Queen on board.